IATA (International Air Transport Association) International Air Transport Association. The trade and service organization representing international airlines from more than 100 countries. ICAO International Civil Aviation Organization. A United Nations agency organized to ensure orderly worldwide technical development of civil aviation. IMO International Maritime Organization. A United Nations affiliated organization representing all maritime countries in matters affecting maritime transportation, including the movement of dangerous goods. The organization also is involved in deliberations on marine environmental pollution. Import License Many countries have currency exchange controls which serve to limit the amount of currency available for the purchase of foreign merchandise. 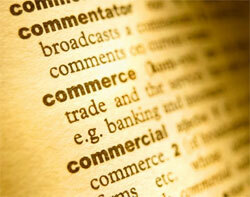 The import license is used to control orders sent to foreign exporters. It is important for exporters to understand their foreign buyer's licensing requirements as payment negotiations are made prior to any exportation. Import License A document issued by a carrier required and issued by some national governments authorizing the importation of goods into their individual countries. In Bond A term applied to the status of merchandise admitted provisionally to a country without payment of duties, either for storage in a bonded warehouse or for transshipment to another point, where duties eventually will be paid. Inland Bill of Lading The Inland Bill of Lading, usually a non-negotiable document, evidences the receipt of goods by an inland carrier for transport from the point of origin to the point of export. These bills of lading include the following export information: "for export," marks and number, "freight prepaid," and special delivery/notification instructions. Inspection Certificate To protect themselves, many foreign firms request a Certificate of Inspection. This may be an affidavit by the shipper, or by an independent inspection firm hired by the buyer, certifying the quality, quantity, and conformity of the goods to the purchase order. Insurance Certificate An Insurance Certificate gives evidence of risk coverage for merchandise shipped. It is sent to the bank with other collection documents, and normally is used only when required by Letter of Credit or Documentary Collection procedures. There are many types of insurance policies available. Coverage requested is usually 110% of the value of the cargo shipped. Insured Value Dollar amount of which goods are insured by shipper. Integrated Carrier An airfreight company that offers a blend of transportation services such as air carriage, freight forwarding, and ground handling. Interchange Agreement A contract between a steamship line and the truck line, stating the (truck line) is responsible for any detention charges and/or repairs that may occur while container is in their possession. Contract also proves that truck line has the required insurance. International Import Certificate This document is the Bureau of Export Administration (BXA) form number BXA-645P. It is required for the import of selected commodities form COCOM nations. The U.S. importer would supply this form, after authorization by BXA, to the foreign exporter so that he could apply for an export license. In-Transit Declaration The In-Transit Declaration, Department of Commerce form 7513, is prepared for shipments in transit form one foreign county to another which pass through the continental U.S., the U.S. Virgin Islands, or Puerto Rico. Also used for merchandise exported from General Order warehouses and for imports rejected by the U.S. government and re-exported. ITN Internal Transaction Number. This is the unique transaction identification number generated by the Automated Export System (AES) for each Electronic Export Information (EEI) filing, indicating the EEI has been accepted. It is a 15 digit code, which begins with the letter "X," followed by the date (taken from the EEI date field), followed by a series of six numbers which represents the total number of AES transmissions or ITNs generated for that day.